The panoramic views from Key West Bar & Grill over the bay will take your breath away. Relax and enjoy these outstanding views from inside the restaurant or from the large sun terrace outside. Key West serves a great tasting varied menu with something to suit everyone’s taste including a delicious range of weekly specials which ensures you are always spoilt for choice. Enjoy a delicious three course meal in a unique location on the end of Bournemouth Pier. 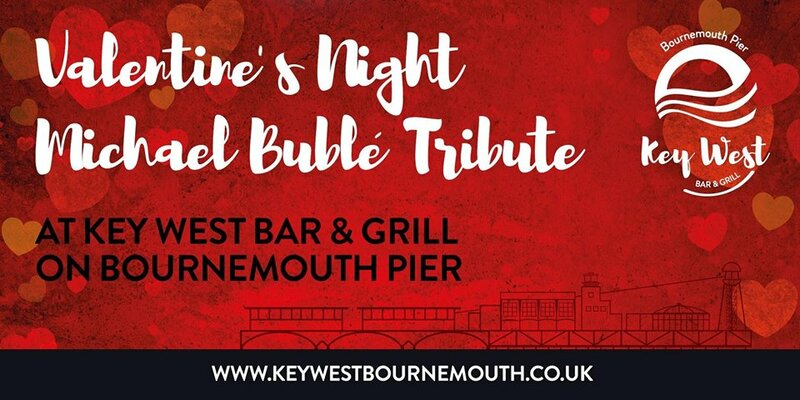 After dinner enjoy Wayne Swift’s musical talents as he sings Michael Bublé’s greatest hits to get you in a romantic mood. Wayne will be followed by a DJ so you can dance the night away too. A lovely surprise for someone special or a fun night out with friends! AND if you book a table for 4 or more, get a FREE bottle of Prosecco! Tickets are £34.95 each available online or at Key West Bar & Grill.